Cardiovascular diseases (CVD) are the primary cause of mortality over the world. Major CVD are caused by atherosclerotic plaques, valve dysfunctions, cardiomyopathy, arrhythmia, and heart infections. We provide you with several tests to evaluate functional or anatomical abnormalities related to heart and vessels. Determination of prothrombine time, activated partial thromboplastin time and fibrinogen activity. ST4 semi automated coagulometer (Diagnostiqua Stago, Gennevilliers, France). It is recommended to collect blood by intra-cardiac puncture. Echocardiography is considered the first-line diagnostic test, from which subsequent imaging or interventions can be recommended. The Vevo 2100 High-Frequency Ultrasound Systems have been developed specifically for use in small animal imaging and are ideally suited for mouse or rat echocardiography. With center operating frequencies ranging from 15MHz to 50MHz one imaging system can be used to assess cardiac function from embryo to adult in many commonly used small animal models. Vevo imaging System (VISUALSONICS, Amsterdam, The Netherlands). Evaluation of the electrical activity of the heart in anesthetized mice. Experimental reproduction of a cardiac infarction by reversible suturing. Implantation of a cannula probe to directly measure arterial of ventricular blood pressure in an anesthetized mouse. Pathological model resulting in average 10% increase in blood pressure but with major fibrosis and left ventricle thickening. Regular forced exercise can create a situation of cardiac hypertrophy. We utilize a swimming regimen in a warm pool over several weeks to induce cardiac hypertrophy. Telemetry blood pressure and heart rate: continuous recording of the systolic, diastolic and mean blood pressure and heart rate in conscious mice. Telemetry EKG: continuous recording of electrocardiogram in conscious mice. The radio-telemetry system consists in implants and receiver: telemetry implants for small animals transmit data to receiver via AM radio waves. Use of hypoxia chambers to induce Pulmonary Arterial Hypertension (PAH) for three of four weeks demonstrates significant resemblance to WHO group III categorized PAH, which includes COPD. Exposure to chronic hypoxia provides a model of COPD and other PAH disorders in mice. For C57BL/6 mice maintained for 21 days at 0% we see highly significant increases in haematocrit, cardiomyocyte surface area, and right ventricular systolic pressure mimicking human PAH. 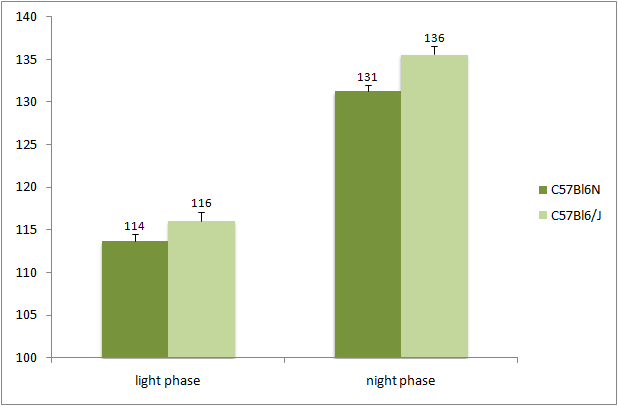 Exposure of C57BL/6N mice to 10% O2 for extended periods resulted in (A) weight loss; (B) increased hematocrit; (C) increase right-ventricular systolic pressure (RSVP); and (D) increased cardiomyocyte surface area. Custom fabricated hypoxia chambers with feedback sensors. Pathological model resulting in average 37% increase in blood pressure with small decrease of myocardial relaxation. Pathological model resulting in average 18% increase in blood pressure with thinkening of arteries and left ventricle. Pathological model resulting in average 17% increase in blood pressure and some left ventricular hypertrophy. Determination of systolic blood pressure and heart rate in conscious mice by tail-cuff method. Determination of intravascular thrombus location. The Vevo 2100 High-Frequency Ultrasound System from Vevo Imaging Systems (VISUALSONICS, Amsterdam, The Netherlands). Identification of specific bacterial loads present in the feces of mice by virtue of quantitative ribosomal 16S DNA sequencing. For more details, please see our Microbia profiling dedicated section. Core body temperature is affected by numerous physiological changes including systemic inflammation, altered nutrient consumption, and physical exertion. Due to circadian changes in body temperature, it is important to measure at regular times of day. Comparison of core body temperature between males mice (N=7) of commonly used laboratory strains determined by digital rectal thermometer. The Apoe targeted mutation mice (Apoe -/-) are unable to produce apolipoprotein E which is essential for the transport and metabolism of lipids. These mice have a markedly altered plasma lipid profile compared to normal mice, and rapidly develop atherosclerotic lesions. A diet high in fat and cholesterol increases the incidence of atherosclerosis in these mice and this model is a useful model especially for pharmacological studies. Mice deficient in low density lipoprotein receptor (Ldlr) have an elevated serum cholesterol level and display very high levels when fed a high fat diet. This model is also commonly used for hyperlipidemia and atherosclerosis research.